I specialise in ocean-based nightmares. I’m not talking about “There, there, I can go back to sleep now”-type nightmares, but “Turn on all the lights, pin my eyelids open, and please don’t make me go back to sleep ever ever ever”-type nightmares. If gold medals were awarded, I’d be the undisputed champion. Whether it’s one of my children being blown off an English Channel ferry into lumpy seas, or being trapped underwater with a limited supply of air, or a hungry shark honing in on my husband, I have the imagination to produce enormous levels of doom-ridden detail. Which is why I spent an hour or two in the small hours of one morning researching the likelihood of Great White Sharks entering San Francisco Bay. Let me back up a step: Great Whites swim along the Pacific coast of California. They thrive in the Farallon Islands, 27 miles west of San Francisco. They love Ano Nuevo, where the elephant seal cubs take to the water. In other words, there are Great White Sharks kicking around California. 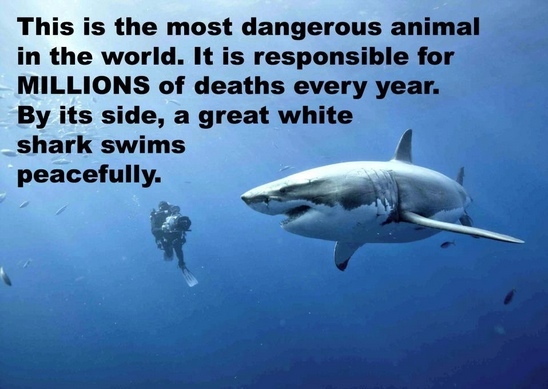 Sharks kill 12 people per YEAR. Humans kill 11,417 sharks per HOUR. Now, I’ve seen the infographics about how horribly maligned these sharks are. They’re not the killers they’re thought to be. They’re more hunted than hunter. But I was brought up on Jaws. I haven’t yet managed to overcome the psychological trauma that induced. Everyone says that there are no Great Whites in the Bay. But there’s no gate in the Golden Gate Strait that stops them entering, and no bouncers under the bridge, so why wouldn’t some daring shark decide to swim in and check out the area one day? My children go tubing in the Bay, and fall into the water. Hence my 2:00am research. So here’s what I discovered. Firstly, Great Whites do come into the Bay. Very occasionally. A Stanford University group put satellite and acoustic tags on 179 Northern Californian Great Whites between 2006 and 2008. Receivers anchored to the Bay floor between the Golden Gate Bridge and Alcatraz Island detected the acoustic tags of five Great Whites in that time. That’s not none, but it’s not many either. Secondly, the last fatal Great White attack in the Bay Area was in May 1959, off Baker Beach. Significantly, Baker Beach is outside the Bay, a mile from the Golden Gate Bridge. And 1959 was a long time ago. The odds of a shark attack are trifling. A bathymetric map of the San Francisco bay area. 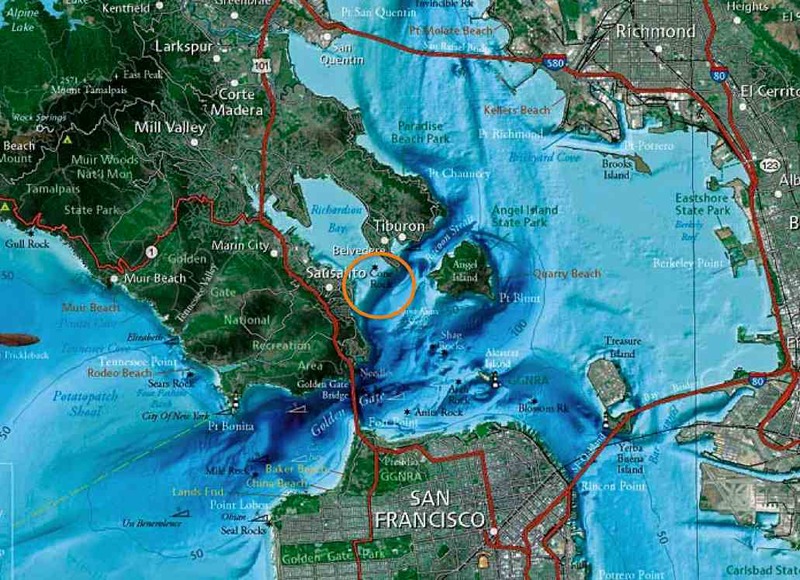 The orange circle shows the underwater cliff between Richardson Bay and the main bay. The lighter the colour, the shallower the water. Thirdly, the Bay is an estuary. Great whites like extremely saline water, and the Bay water is too brackish. They also like it cold, and Bay water tends to be warmer than the Pacific, because water runs from the land. And because it’s shallow. 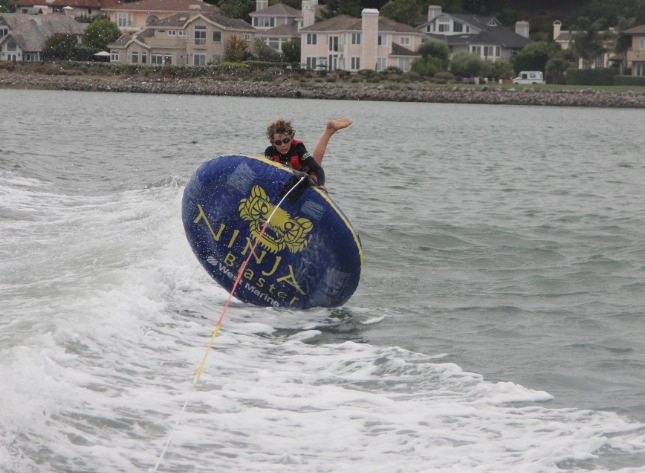 While the ocean floor is 360 ft deep under the Golden Gate Bridge, Richardson Bay – a bay within the Bay, and the place my children go tubing – is a mere 7 ft deep. Richardson Bay shelves off steeply from Marin into the main Bay (it’s an underwater cliff). The shallowness means that the chances of Great White Sharks swimming into Richardson Bay are negligible. The sharks need 15 ft of water to be able to hunt, and there are many better, deeper places to do just that. Fourthly, there has never, ever, ever been a shark attack in Richardson Bay. And, fifthly, there are swimming clubs in the Bay Area that encourage their members to take part in the “Sharkfest” swimming competitions. One goes from Alcatraz to San Francisco, and another goes from the south tower of the Golden Gate Bridge to beyond the north tower. Those swimmers are easy pickings for sharks, but not a single one has ever been attacked. After a few hours of midnight research, I concluded that – even as masochistically drawn to the possibility of marine disaster as I am – the chances of my children being attacked by a shark were sufficiently non-existent that I could sleep peacefully. So, who’d like to come tubing with us? About to end up in the water. It’s a good job there are no man-eating sharks.